7 Mile House is so thankful for such a wonderful year! From our first annual jazz fest, to the adobo cook-off, to publishing See You At The 7, we are so grateful to the 7 Mile House community. Read our year round-up below. See You At The 7 - was published last January and toured the Bay Area with Vanessa Garcia presenting on the history of Bay Area mile houses, and 7 Mile House in particular. Written by Vanessa Garcia, and co-authored by award-winning editor Regina Abuyuan, with a foreword by San Francisco Chronicle columnist Carl Nolte (Native Son). The book contains old maps of the area, historic photos, and interviews with locals who recount their experiences at 7 Mile House over the years. Vanessa was invited to speak about See You At The 7 over 20 times, and in over 15 locations, including the SF Main Branch Library, SF History Days, and The California Historical Society, to name a few. Check out some of the highlights below. 7 Mile House is so thankful to our community for voting for us in all of these categories! 7 Mile House won a staggering 14 awards this year! In case you missed any, here is the 2018 Round Up of all the Awards we received this year! On the heels of celebrating their 160-year anniversary, the Bay Area’s historic 7 Mile House produced their first annual “7 Mile House Jazz Fest,” on Saturday, March 17, 2018. The festival featured 11 bands, an impressive array of the Bay Area’s top jazz musicians and ensembles. It also marked the first annual “7 Mile House Jazz Awards” for the following categories: Outstanding Bay Area Jazz Presenters, Outstanding Bay Area Jazz Promoters, and Outstanding Bay Area Jazz Artists; and hosted by KCSM Jazz 91 DJ, Alisa Clancy, and other on-air personalities. 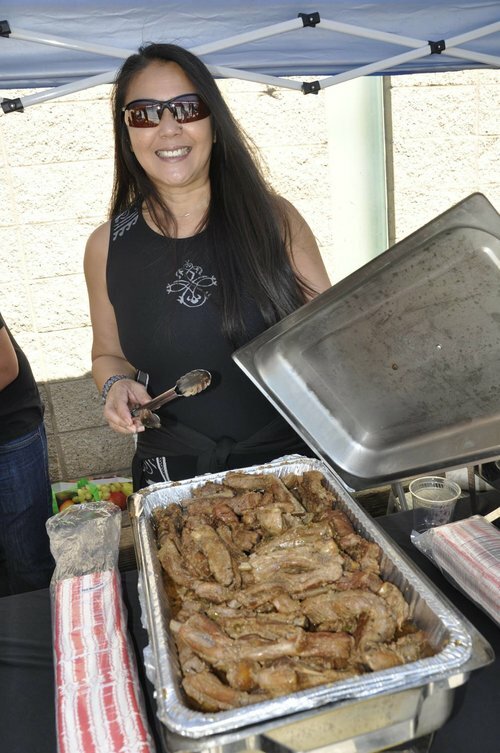 On July 14, 2018 the 7 Mile House Famous Pork Adobo was challenged by other adobo recipes nominated by YOU, our customers, for the second annual "7 Mile House Adobo Cook Off"! 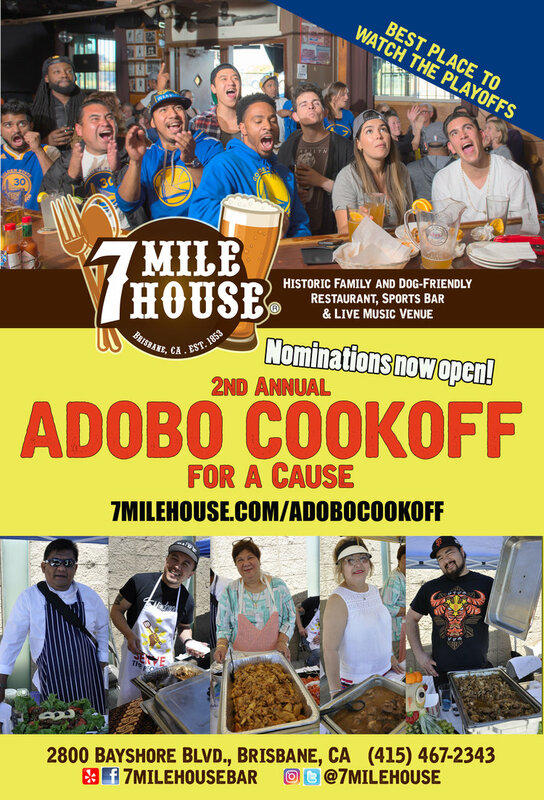 7 Mile House held the second annual Adobo Cook-Off fundraiser for St. Paul of the Shipwreck Catholic Church in Brisbane, CA. Rommel Conclara reports. The 'Adobo Cook-off For a Cause' recipient is St. Paul of the Shipwreck Church! This year's contestants helped us raise $1,750 for the organization! 1st place winner! - Josi Bartlett shares "As a native San Franciscan, Adobo is my favorite Filipino comfort food. As a non-cook, my adobo is my One-Hit-Wonder. It’s the only dish I take pleasure in making because I enjoying seeing the expressions of delight when people eat my adobo. Never expect leftovers. ENJOY! So what’s next in 2019?! You’ll have to check the events calendar and subscribe to the newsletter to be the first to know. You can also stay in touch on Facebook, where you’ll catch live streaming videos of world-class musicians playing on the 7 Mile House stage, almost every night! If you’re on the ‘gram, follow along and get up close and personal with our vast menu of homestyle, American and Filipino food.